Who Doesn’t Use Page Numbers? Plenty of original records are in bound volumes without page numbers. Frustrating as it is, researchers whose work extends before 1900 will encounter volumes with pages that have no numbering to them at all. The citation to this record needs to include enough detail so that you or someone else can easily find the record again. Don’t just make a copy without thinking about how you located the record. How did you find the record in the first place–were you in the births for 1850, the deaths from 1823, etc.? Were the entries within a specific year numbered? Your citation does not have to be in “perfect” form, but include enough detail so the record can be found again. When you’ve reached a stumbling block in the research of your long-dead ancestors, consider writing some of your own story–childhood experiences, school experiences, etc. Record that information that rarely gets recorded and that we all wish our long-dead ancestors had left behind for us. Was There an Unknown First Name? My German born ancestor was George Trautvetter–born in the 1790s. He had brothers Adam, Michael. and Henry. 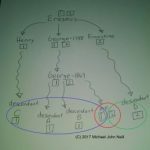 I was years into researching the family before I learned that at least two of them really had the first name of John or Johann–using that first name combined with the middle name made finding them easier. They dropped the “first name” after a while in the United States, but used it on passenger lists and records early in their settlement. Is your ancestor hiding under an “unknown” first name? Was There a Contemporary Transcription? If you are fortunate enough to obtain a copy of your ancestor’s will, it may be that parts of it are difficult to read. Was there a contemporary transcription of the will made by the court that approved the probate of the will? Often the will was ordered to be “filed” for record and that transcription may be easier to read than the original. There’s always the chance that the record copy contains an error and it won’t contain the actual copy of your ancestor’s signature, but it may be easier to read than the original. Any In-Law Get a Widow’s Pension? If any sibling or sibling-in-law of your ancestor received a military pension, especially a widow’s pension, consider obtaining the records. Widows needed to prove their marriage to the serviceman in addition to his service and need. Family members were frequently the ones who provided testimony, particularly to the marriage.